Logical, original, creative thinkers. Can become very excited about theories and ideas. Exceptionally capable and driven to turn theories into clear understandings. Highly value knowledge, competence and logic. Quiet and reserved, hard to get to know well. Individualistic, having no interest in leading or following others. As an INTP, your primary mode of living is focused internally, where you deal with things rationally and logically. Your secondary mode is external, where you take things in primarily via your intuition. INTPs live in the world of theoretical possibilities. They see everything in terms of how it could be improved, or what it could be turned into. They live primarily inside their own minds, having the ability to analyze difficult problems, identify patterns, and come up with logical explanations. They seek clarity in everything, and are therefore driven to build knowledge. They are the “absent-minded professors”, who highly value intelligence and the ability to apply logic to theories to find solutions. They typically are so strongly driven to turn problems into logical explanations, that they live much of their lives within their own heads, and may not place as much importance or value on the external world. Their natural drive to turn theories into concrete understanding may turn into a feeling of personal responsibility to solve theoretical problems, and help society move towards a higher understanding. INTPs value knowledge above all else. Their minds are constantly working to generate new theories, or to prove or disprove existing theories. They approach problems and theories with enthusiasm and skepticism, ignoring existing rules and opinions and defining their own approach to the resolution. They seek patterns and logical explanations for anything that interests them. They’re usually extremely bright, and able to be objectively critical in their analysis. They love new ideas, and become very excited over abstractions and theories. They love to discuss these concepts with others. They may seem “dreamy” and distant to others, because they spend a lot of time inside their minds musing over theories. They hate to work on routine things – they would much prefer to build complex theoretical solutions, and leave the implementation of the system to others. They are intensely interested in theory, and will put forth tremendous amounts of time and energy into finding a solution to a problem with has piqued their interest. INTPs do not like to lead or control people. They’re very tolerant and flexible in most situations, unless one of their firmly held beliefs has been violated or challenged, in which case they may take a very rigid stance. The INTP is likely to be very shy when it comes to meeting new people. On the other hand, the INTP is very self-confident and gregarious around people they know well, or when discussing theories which they fully understand. The INTP has no understanding or value for decisions made on the basis of personal subjectivity or feelings. They strive constantly to achieve logical conclusions to problems, and don’t understand the importance or relevance of applying subjective emotional considerations to decisions. For this reason, INTPs are usually not in-tune with how people are feeling, and are not naturally well-equiped to meet the emotional needs of others. The INTP may have a problem with self-aggrandizement and social rebellion, which will interfere with their creative potential. Since their Feeling side is their least developed trait, the INTP may have difficulty giving the warmth and support that is sometimes necessary in intimate relationships. If the INTP doesn’t realize the value of attending to other people’s feelings, he or she may become overly critical and sarcastic with others. If the INTP is not able to find a place for themself which supports the use of their strongest abilities, they may become generally negative and cynical. If the INTP has not developed their Sensing side sufficiently, they may become unaware of their environment, and exhibit weakness in performing maintenance-type tasks, such as bill-paying and dressing appropriately. For the INTP, it is extremely important that ideas and facts are expressed correctly and succinctly. They are likely to express themselves in what they believe to be absolute truths. Sometimes, their well thought-out understanding of an idea is not easily understandable by others, but the INTP is not naturally likely to tailor the truth so as to explain it in an understandable way to others. The INTP may be prone to abandoning a project once they have figured it out, moving on to the next thing. It’s important that the INTP place importance on expressing their developed theories in understandable ways. In the end, an amazing discovery means nothing if you are the only person who understands it. The INTP is usually very independent, unconventional, and original. They are not likely to place much value on traditional goals such as popularity and security. They usually have complex characters, and may tend to be restless and temperamental. They are strongly ingenious, and have unconventional thought patterns which allows them to analyze ideas in new ways. Consequently, a lot of scientific breakthroughs in the world have been made by the INTP. The INTP is at his best when he can work on his theories independently. When given an environment which supports his creative genius and possible eccentricity, the INTP can accomplish truly remarkable things. These are the pioneers of new thoughts in our society. Friendly, adaptable, action-oriented. “Doers” who are focused on immediate results. Living in the here-and-now, they’re risk-takers who live fast-paced lifestyles. Impatient with long explanations. Extremely loyal to their peers, but not usually respectful of laws and rules if they get in the way of getting things done. Great people skills. As an ESTP, your primary mode of living is focused externally, where you take things in via your five senses in a literal, concrete fashion. Your secondary mode is internal, where you deal with things rationally and logically. ESTPs are outgoing, straight-shooting types. Enthusiastic and excitable, ESTPs are “doers” who live in the world of action. Blunt, straight-forward risk-takers, they are willing to plunge right into things and get their hands dirty. They live in the here-and-now, and place little importance on introspection or theory. The look at the facts of a situation, quickly decide what should be done, execute the action, and move on to the next thing. ESTPs have an uncanny ability to perceive people’s attitudes and motivations. They pick up on little cues which go completely unnoticed by most other types, such as facial expressions and stance. They’re typically a couple of steps ahead of the person they’re interacting with. ESTPs use this ability to get what they want out of a situation. Rules and laws are seen as guidelines for behavior, rather than mandates. If the ESTP has decided that something needs to be done, then their “do it and get on with it” attitude takes precendence over the rules. However, the ESTP tends to have their own strong belief in what’s right and what’s wrong, and will doggedly stick to their principles. The Rules of the Establishment may hold little value to the ESTP, but their own integrity mandates that they will not under any circumstances do something which they feel to be wrong. ESTPs have a strong flair for drama and style. They’re fast-moving, fast-talking people who have an appreciation for the finer things in life. They may be gamblers or spendthrifts. They’re usually very good at story telling and improvising. They typically makes things up as they go along, rather than following a plan. They love to have fun, and are fun people to be around. They can sometimes be hurtful to others without being aware of it, as they generally do not know and may not care about the effect their words have on others. It’s not that they don’t care about people, it’s that their decision-making process does not involve taking people’s feelings into account. They make decisions based on facts and logic. ESTP’s least developed area is their intuitive side. They are impatient with theory, and see little use for it in their quest to “get things done”. An ESTP will occasionally have strong intuitions which are often way off-base, but sometimes very lucid and positive. 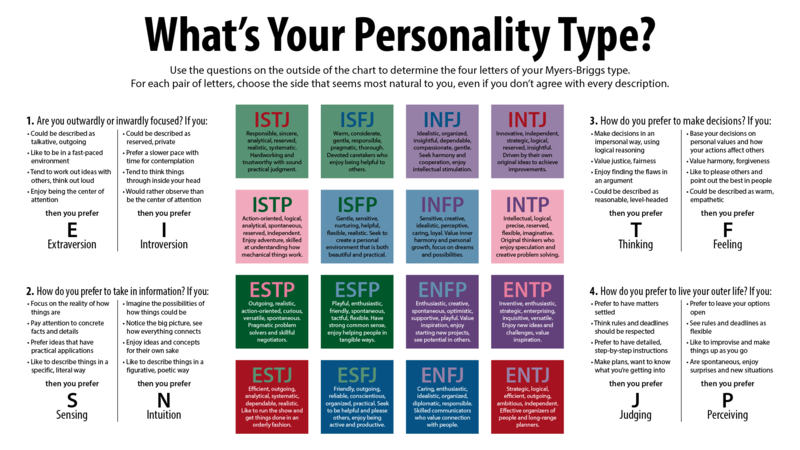 The ESTP does not trust their instincts, and is suspicious of other people’s intuition as well. The ESTP often has trouble in school, especially higher education which moves into realms where theory is more important. The ESTP gets bored with classes in which they feel they gain no useful material which can be used to get things done. The ESTP may be brilliantly intelligent, but school will be a difficult chore for them. The ESTP needs to keep moving, and so does well in careers where he or she is not restricted or confined. ESTPs make extremely good salespersons. They will become stifled and unhappy dealing with routine chores. ESTPs have a natural abundance of energy and enthusiasm, which makes them natural entrepreneurs. They get very excited about things, and have the ability to motivate others to excitement and action. The can sell anyone on any idea. They are action-oriented, and make decisions quickly. All-in-all, they have extraordinary talents for getting things started. They are not usually so good at following through, and might leave those tasks to others. Mastering the art of following through is something which ESTPs should pay special attention to. ESTPs are practical, observant, fun-loving, spontaneous risk-takers with an excellent ability to quickly improvise an innovative solution to a problem. They’re enthusiastic and fun to be with, and are great motivators. If an ESTP recognizes their real talents and operates within those realms, they can accomplish truly exciting things.